Buy the best quality Four Tier Racks at rock-bottom prices, from us. Available with us in different grades and specifications, our Racks have strong built and cost effective prices. Also, we manage a huge stock for furnishing urgent and massive requirements of the buyers. Buyers are requested to place orders, timely deliveries are guaranteed with us. 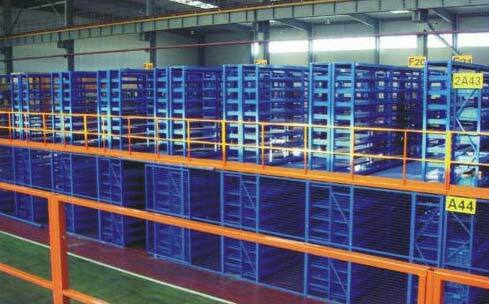 Two / Three Tier Slotted Angle Storage Systems are unique and mostly used by Defence, Ware houses and Industries where space is acute short and vertical space is available for storage. The Racking Systems is design in such a way that it starts from floor and divided at 1st and 2nd floor by Catwalks. The materials could be lifted by Manual, Conveyer and Forklift, one store can store three fold material by installing this storage systems.